Sometimes getting in to see a specialist for your medical condition is difficult. Challenges like distance and physical limitations can make traveling feel impossible. The providers of New England Telemedicine understand this unique challenge and want to offer you a better way to get the same high quality care- without ever leaving your hometown. We want you to be able to see the best medical providers in the region for your needs and now it's easier than ever with telemedicine technology. 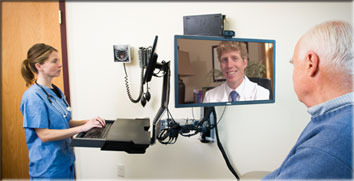 Telemedicine allows you or a loved one to "see" a specialist through an internet connection. Your specialist will be able to hear you and see you in real time, will listen to your concerns, and answer your questions. He or she can even use some of today's most advanced technology to listen to your heart and lungs, or see inside your ears. Our specialty providers will work closely with your primary care team, and it's all done from hundreds of miles away. 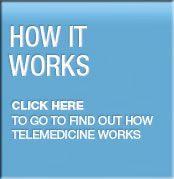 How do I see a doctor with New England Telemedicine? Our office partners with your primary care provider to determine what kind of specialist you need to see. 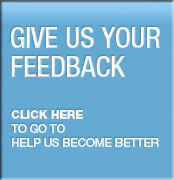 Because your primary care provider knows you best, we value his or her opinion of your unique medical situation. Once they initiate a referral we will use telemedicine technology to make sure you get access to great specialists - so you can get better faster. Our team of physician specialists are instructors and professors of medicine from some of the best medical facilities in New England. 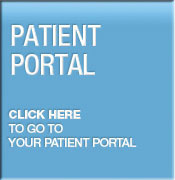 Using a location within your local hospital, we will set up an appointment time for you to meet with the physician over the internet. Your specialist will review your medical history, interview and examine you, review lab work then make a diagnosis and begin treatment.